The MSP430 Launch Pad arrived! Christmas came early! Look what just arrived in the mail! It's the ultra low-cost Texas Instruments LaunchPad, a USB-based experimenter board I ordered a few weeks ago. The board is for experimenting with 14/20-pin MSP430 Value Line microcontrollers, designed for low power consumption as well as low cost. At only $4.30 the experimenter board is about as budget-friendly as you can get. The MSP430G2231 chips cost about $1.75 at Mouser, although two came with the box. 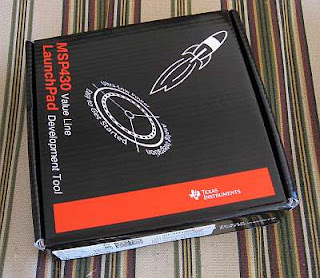 Development environment and tools are free at www.ti.com/launchpadwiki (Windows only). There's also a GCC toolchain, MSPGCC. Mac OS X folks, check this wiki page. What comes in the box? Experimenter board of course. USB cable. Pin headers, two MSP430G22231 14-pin PDIP MCUs, 32.768 kHz SMT cyrstal, and a couple of cute little LaunchPad stickers. The MCU specs are: clock speed up to 16MHz, RISC architecture, 2kB Flash, 128B RAM, 10 GPIO, 1x 16-bit timer, USI (I2C, SPI), Internal Temp Sensor, and 8ch 10-bit ADC. Contents. More goodies under the white tab. I started by installing the IAR Embedded Workbench IDE for MSP430. The CCS tool requires at least 1G of memory and my garage sale PC is memory-challenged. Next, open up the User's Guide for the IAR Embedded Workbench. Read the Get Started Now! section which describes how to configure the IDE, compile, download and run your code. 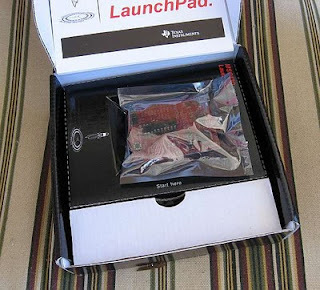 You should have a flashing red LED on your LaunchPad. Yippee! Now, let's see... what can we do with this thing? The www.43oh.com website has lots of ideas. So do these sites: www.msp430launchpad.com and mspsci.blogspot.com And there's the forum at 43oh as well as this Ti MSP430 Forum and this Google group and a Yahoo Group. Thanks for the shout-out for my blog. Hope your having fun with the LaunchPad. The MSP430 line is really great. looks pretty sweet. make something cool and post it! Great news! They seemed to ship pretty fast. They sent my second one last week.